It was only two and a half years ago that Eahly and Nan arrived in Calgary, eager to put roots down and make this city “home”. Coming from Vancouver, they were surrounded by a plethora of dietary options, including amazing variety in vegetarian and vegan fare; but found fewer options in our beef-centric city. Then, one day in October 2011, while shopping at the Calgary Farmers’ Market, they noticed a vacant booth and a seed was planted. What if? Beginning on a hope and whim, Eahly and Nan set out to bring more options to vegans (and non-vegans too) and share their passion for healthy, delicious food. If you’ve ever been by Hearts’ Choices, you will instantly see (and feel) the love that goes into creating and sharing their vegan Thai food. Driven by Nan’s philosophy: “no good food = no happiness”, every dish they make, whether it be Thai Vegan Curries, Peanut Satay Sauce, or Bamboo Shoot Stir Fry, is handmade with care and intention. And their high quality, non-GMO soybean vegan products are mindfully sourced from a renowned Buddhist vegan company in Taiwan. We know it’s easy to turn your nose up at vegan food if you’re a born and bred meat-lover. Tofu? Tempeh?! Vegan Scallops?!?! Get outta Cowtown. But in all seriousness, Eahly and Nan help many families bridge the gap when there is a division in the kitchen. For example: wife is a vegetarian, husband wants his steak; now they can make one meal for everyone because the vegan fare at Hearts’ Choices can fool even the most discerning palates and satisfies everyone’s needs. Eahly and Nan believe that their food “helps make their life a little more harmonious and happy”. That’s what makes them love coming to work every day. It comes as no surprise then that they love when you drop by their booth or send them a photo of your own creation, sharing a part of your heart with them. And now they’re sharing that love with you! 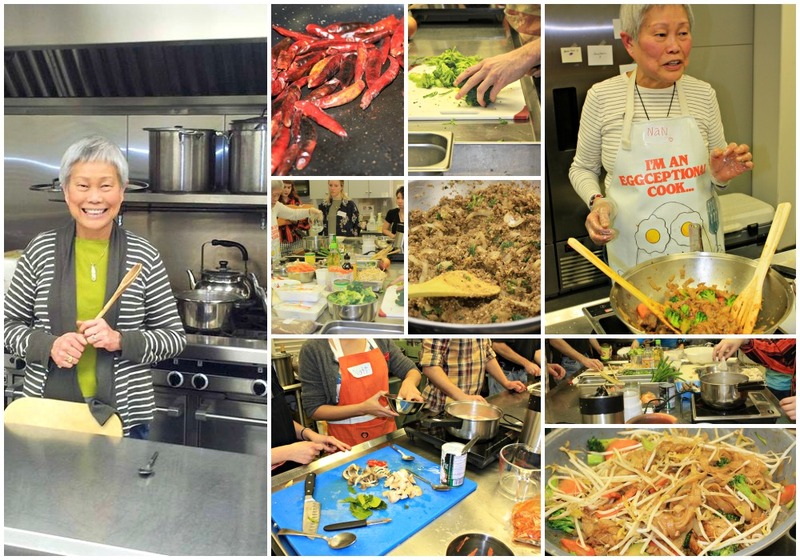 Join them for an evening of food creation and fun as Nan (originally from Thailand) teaches the basics of Thai vegan cooking in a hands-on interactive cooking class. We recently crashed one of their classes to get our own hands dirty (and our bellies happy!) and were pleasantly surprised to find people of all ages, all levels of cooking experience, even non-vegans soaking up Nan’s knowledge and cooking up a storm. We couldn’t help but join in too. The Thai Vegan Larb Salad, Tom Kha Pak (a sweet and sour coconut vegetable soup), and Pad Se-ew (Thai Street Noodles) that we all whipped up were delicious, healthy, and didn’t last long. If you’ve ever wanted to learn more about vegan cooking or you’re just interested in exploring Thai ingredients and dishes, you can join Eahly and Nan in their upcoming class (hosted April 7th). Classes run approximately 3 hours, and include all the equipment, ingredients, and teaching required for you to create 3-4 delicious dishes while learning the basics of Thai cuisine with lots of cooking and eating along the way. Do you have to be a Vegan to enjoy this opportunity? Absolutely not! In fact, it is perhaps the most reasonably priced Thai cooking classes in the city. So… can you throw chicken in the Tom Kha Pak? Yes! Will Nan and Eahly frown upon it? Never. Sounds yummy doesn’t it? Get your tickets before they’re sold out! And don’t forget to swing by Hearts’ Choices the next time you’re at the Calgary Farmers’ Market; say hi to Nan and Eahly, try one of their many samples, and show them some love. Like them on Facebook or Follow them on Twitter.